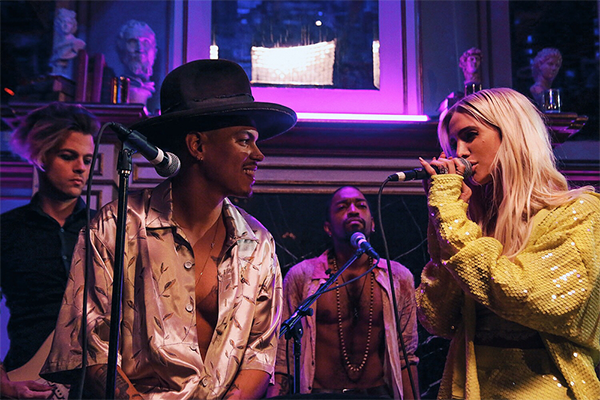 Ashlee Simpson opened up in a big way about her connection to husband and actor Evan Ross and how he pursued her at an intimate party on Friday night in Los Angeles at Warwick LA. A source close to the couple told Fox News that during the swanky event, the 33-year-old songstress couldn’t help herself as she let partygoers in on how she and her hubby met. “Ashlee also told a story about how they first met at Beverly Hills Polo Club. She was out to lunch with her mom and he kept staring at her. He finally came up to her and said ‘there’s nothing sexier than being a mother. Shortly after they began dating,’’ said the source. Simpson and Ross, 29, have been married since 2014 and have a 2-year-old daughter, Jagger Snow and Simpson is also mom to Bronx, 9, from her previous marriage to Pete Wentz. While things might look rosy on the outside, Simpson recently admitted to E! News that their four-year marriage doesn’t come without its own challenges. Ross chimed in on his wife’s sentiment and it’s clear that the duo is in agreement when it comes the resiliency of their marriage. Simpson and Ross’ show, “Ashlee and Evan” is slated to debut on E! “in a few months,” according to sources familiar with production.